IRON MAN 2: Comic Book Hero in IMAX! Already sold out on it’s opening morning IMAX showings at 12:01 AM locally in Los Angeles, the highly anticipated sequel to Stan Lee’s Marvel Comics character, IRON MAN 2 opens Friday, May 7th. Produced and Directed by Jon Favreau who also plays Happy Hogan in the movie. 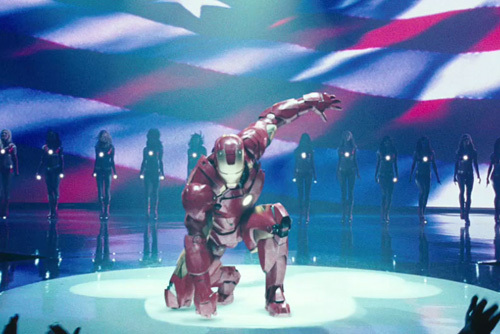 Tony Stark celebrates his crime fighting success in the opening scene in IRON MAN 2. Robert Downey Jr. returns as “Iron Man”, billionaire weaponry creator Tony Stark, heir to Stark Enterprises. Surrounded by equally strong characters, Stark meets duo identity toting Natasha Romanoff, a.k.a. “Black Widow” (Scarlett Johansson) who tag-teams him and allys with him for recruitment into “The Avengers” with Nick Fury (Samuel L. Jackson), leading agent of S.H.I.E.L.D. When you have a powerful, profitable, and patented technology, everyone who can feasibly obtain it, is out to do so. This is the daily life of Stark in IRON MAN 2. Russian Nemesis and scientist Dr. Anton Vanko’s son, Ivan Vanko (Mickey Rourke), a physicist, makes it his mission in the film to kill Stark then bask in his own scientific success. His efforts are accessorized by competing industrialist Justin Hammer (Sam Rockwell) who has his own agenda against Stark. IMAX delivers the clearest and most immersive picture quality to fully appreciate the explosion scenes, high-tech equipment, holograms, and fighting scenes. If you’re a fan of video games, any number of the brilliant actors in the film, or of course, Marvel Comics, this film is a must see!